Who was Ramsay Macdonald? When was Asquith? What (and why) was Bonar Law? 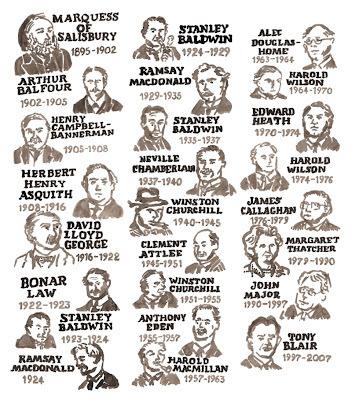 Whenever I hear one of these names I wish I knew more about British politics of the past hundred years. I was about to say that I don't care so much about the Nineteenth Century... but now I sense a creeping uncertainty about Gladstone, Disraeli, Palmerston, Peel and Melbourne. 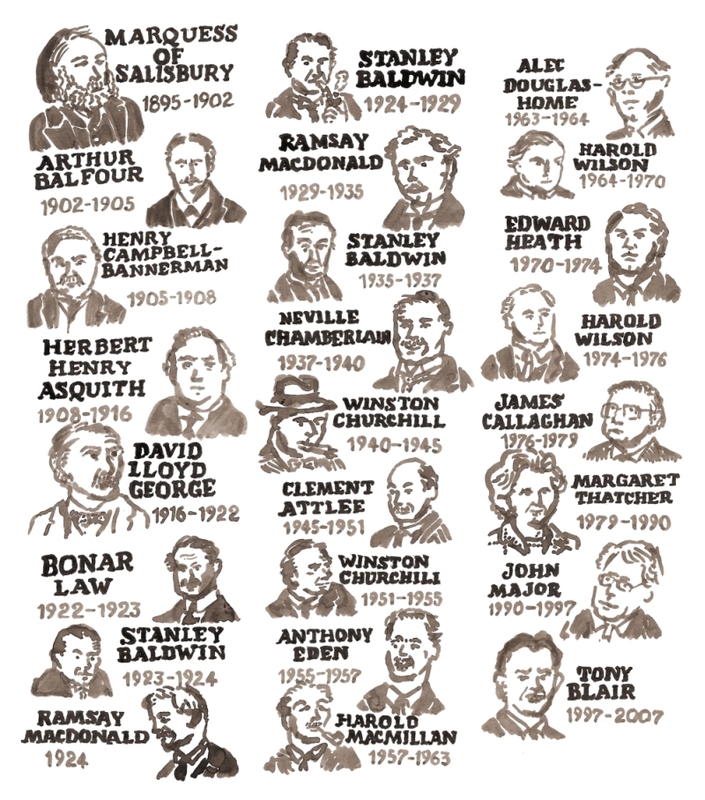 Still, for my own benefit, I've just drawn up a list of Twentieth Century prime ministers. Hold onto your heraldic hats - it's time for a celebration of chivalry. Last week I visited the College of Arms, in London, on an evening tour organised by the V&A. Heraldry and calligraphy have always appealed to me, and anyone working for the College of Arms has to take pleasure in the fine rules and colourful terms. I spent many childhood hours poring over old and older books by people with double-barrelled names, and wondered what arcane heights of gilded tradition and scholarship might be inside the College, near to St. Paul's in London. Because I love this subject, here I shall write up most of the notes that I made. You can find out a whole lot more at the College Of Arms website. Here goes! We saw three of the many rooms: the first is open to the public every day; the second is where any appointments take place; the third is never open, being the library and archive. There is wood panelling, flags, portraits of past heralds, and emblems and models here and there, including an elephant, a blue kiwi holding a hammer, and a black turret with a golden lion holding a lit grenade - all too large to fit on top of any knight's helmet. Oh, and a figure of Churchill in his full regalia. The College is technically a remote part of the royal household and the chief position, Earl Marshal, has been the Duke of Norfolk for generations. He is the Garter King of Arms, the most important of three Kings of Arms. Below them are six heralds and four pursuivants. (See details at the bottom of the post). After over five hundred years, they are still granting arms, having come into existence to record and regulate use of heraldic identities; facilitate its use for tournaments and battle; and to organise the coronation. All of the Officers deal with clients who want to buy a coat of arms (because they are available purely for money, and not linked at all with any title or honour); carry out research work and, very occasionally, get dressed up in tabards of the royal arms to take part in the state opening of parliament and the garter procession at Windsor. There are apprentices, artists and scriveners, and the ultimate product, for anyone buying arms, is a vellum document ("letters patent), with seals attached, describing the design in detail. It comes rolled up in a red box with royal monograms in gold. The first room (the one that you can see at any time) is the Earl Marshal's Court (or the Court of Chivalry), where any disputes about use of arms would be heard. This has only happened once in well over a century. 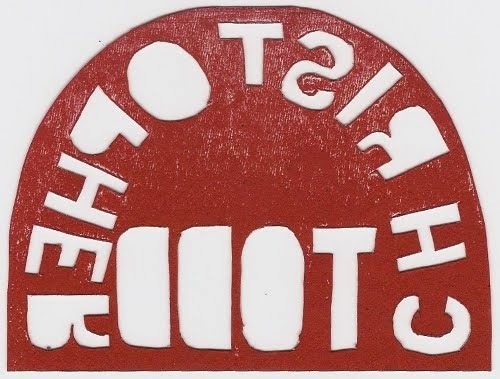 In 1953 a case began there (before adjourning to the Royal Courts of Justice), in which the Corporation of the City of Manchester objected to the use of its arms and seal by the Manchester Palace of Varieties theatre. This a serious business and the design (or, technically, the description) of a coat of arms is absolutely the property of a corporation or individual and their direct descendants only. The library contains armorials, books of precedence and peerage, helmets and other artifacts, archives of grants, albums of symbols and family trees in books of all sizes, hundreds of years old; some with the paint still vivid on vellum. In the Seventeenth Century, the heralds made "visitation" to each county, to make records of people who had been using coats of arms since before the rules were introduced. Immediately after the Civil War, Gregory King, a herald and a draughtsman, used his travels to make documentary sketches of ecclesiastical architecture, in case of further destruction. 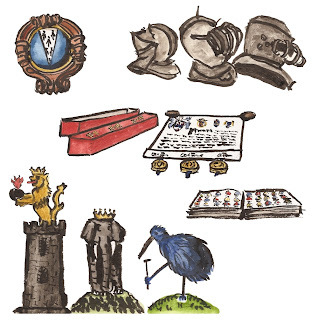 Helmets, letters patent and the red box, an armorial and some over-sized crests. Plenty of individuals and organisations still want a coat of arms, a crest, a motto and so on. The College covers all of England and Wales and much of the Commonwealth (Scotland has its own heralds), and makes 150 to 200 grants each year (it was even more popular in the 1980s). You can have any emblem, as long as it will look good - and look good in the future. Although there is a hefty code of design, it doesn't work in the same way as corporate design documents: your red will just be any red that can be called red. As long as an artist is faithful to the long description of the shield, it will be correct. The Officers steer clients towards a lasting design, but there is room for some playful references. The College website has a gallery of recent grants with descriptions. I feel like I've gorged on heraldry. There is always more to read and always someone who knows more. It's almost a bad habit. I hope you get sucked in too. Pursuivants: Blue Mantle, Rouge Dragon, Rouge Croix and Portcullis. Heralds: York, Richmond, Somerset, Windsor, Lancaster and Chester. Provincial Kings of Arms: North and South. ...that's what I have to do in the next few days. 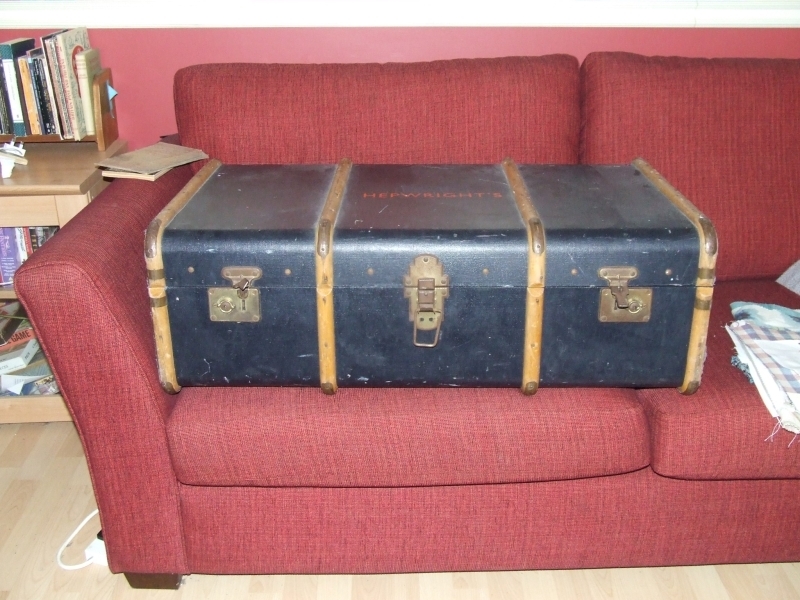 Hepwrights Vintage in Bedford Place, Southampton ("One of the UK shops you NEED to know" - Glamour), needed someone to decorate a large trunk. It's to be taken to vintage fairs, markets and other events, as an advertisement for the shop. The proprietress has just dropped it round and now I have a week or so to cover it with information and "loveliness". ...BUT I'm off to Manchester for the weekend, so there's a risk that the trunk will end up covered with little Lowry figures.